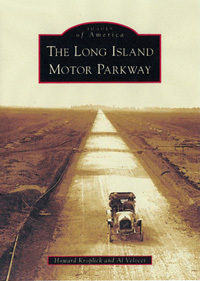 A new book on the Long Island Motor Parkway will be published by Arcadia Publishing and will be available on September 1, 2008. The over 200 rare images in this book, many published for the first time, have been selected from the archives of major museums, libraries, and private collectors. All author royalties from the book are being contributed to CAPS (Child Abuse Prevention Services of Long Island). A forerunner of the modern highway system, the Long Island Motor Parkway was constructed during the advent of the automobile and at a pivotal time in American history. Following a spectator death during the 1906 Vanderbilt Cup Race, the concept for a privately owned speedway on Long Island was developed by William K. Vanderbilt Jr. and his business associates. It would be the first highway built exclusively for the automobile. Vanderbilt’s dream was to build a safe, smooth, police-free road without speed limits where he could conduct his beloved automobile races without spectators running onto the course. Features such as the use of reinforced concrete, bridges to eliminate grade crossings, banked curves, guardrails, and landscaping were all pioneered for the parkway. Reflecting its poor profitability and the availability of free state-built public parkways, the historic 48-mile Long Island Motor Parkway closed on Easter Sunday, April 17, 1938. Howard Kroplick is the author of Vanderbilt Cup Races of Long Island. He is a lecturer, research volunteer at the Suffolk County Vanderbilt Museum, and member of the Vanderbilt Cup Race Centennial Committee and Long Island Motor Parkway Panel. Al Velocci is the author of The Toll Lodges of the Long Island Motor Parkway, and Their Gatekeepers’ Lives. He is also a research volunteer at the Suffolk County Vanderbilt Museum and a member of the Long Island Motor Parkway Panel. Howard Kroplick, a research volunteer at the Suffolk County Vanderbilt Museum, has extensively researched and lectured on the Vanderbilt Cup Races. He is a member of the Vanderbilt Cup Race Centennial Committee and the Long Island Motor Parkway Panel and is the CEO and owner of the Impact Group, a Manhattan-based medical communications company. Florence Ogg, who contributed the foreword, is the director of collections and archives at the Suffolk County Vanderbilt Museum. To contact Howard Kroplick, please email howard@kroplick.com.